Following up last week’s look at 10 popular Amish male names, we have the female version as promised. As with the male names list, I’ve included five Biblical-origin names, and five non-Biblical ones, since Amish tap both sources. At the end, I’ve also included 10 uncommon female names. While last week I mainly relied on Raber’s Almanac to find male first names, that approach wouldn’t work this week. Raber’s Almanac contains a listing of Amish church ministers, who are only males. So I searched a number of church directories for the female names you see below. I’ve also included background info for most names. Hope you enjoy reading it as much as I did creating it. Background information on names is taken from A Dictionary of First Names by Patrick Hanks, Kate Hardcastle & Flavia Hodges unless otherwise noted. Sarah – In the Old Testament, Sarah was originally called Sarai, which possibly meant “contentious” in Hebrew. God made the change to Sarah, meaning “princess”, as part of a covenant. Sadie was apparently once a pet form of Sarah, but is now considered its own name (also a popular one). Linda – According to the Dictionary of First Names, “Of relatively recent origin and uncertain etymology.” Possibly a shortened form of Belinda. Or, derived from other Germanic names ending in “-lind”. First recorded in the 1800s. Mary – New Testament form of Miriam (another name popular with Amish). Borne by the Virgin Mary, and other Biblical figures including Mary sister of Martha, and Mary Magdalene. One of the most common female names. Ruby – From the name of the red gemstone. Quite a few Rubies in northern Indiana. Fannie – The diminutive form of Frances; variant form Fanny. According to Behind the Name, “In the English-speaking world this has been a vulgar slang word since the late 19th century, and the name has subsequently dropped out of common use.” Not among the Amish, where it remains popular. Elizabeth – The mother of John the Baptist. Spelled Elisabeth in the King James Bible, though Amish seem to favor the “z” form. Means “God is my oath.” Lizzie is a popular form in some Pennsylvania communities. Emma – An old French name of Germanic origin, at first a short form of compound names. Popular in medieval England, has become more popular in general society since the 1970s. Rebecca – Latin form of the Hebrew Rebekah. In the Old Testament, the wife of Isaac and mother to Jacob and Esau. Pretty common in Lancaster County. Lovina – The background of this one was the hardest to find. You may also see it as Lavina, which according to Behind the Name is a variant of Lavinia. In Roman mythology, Lavinia was the wife of Aeneas, and “the mother of the Roman People.” Another example of how many Amish first names are not Biblically-based. Naomi – Another Old Testament name. From the Hebrew נָעֳמִי (Na’omiy) which means “pleasantness”. Ruth’s mother-in-law. Amish, at least in Lancaster County, pronounce this “Nay-oh-mah” rather than “Nye-oh-mee” like I would want to pronounce it. Now that we’ve looked at common names, how about the less common ones? Paging through church directories, I found a nice mix of creative (invented?) names, and obscure ones. I could find a Biblical origin for only one of these, and you’ll see it’s unusual in its own way. Some, like “Rosmanda”, seem to be a combination of two names. 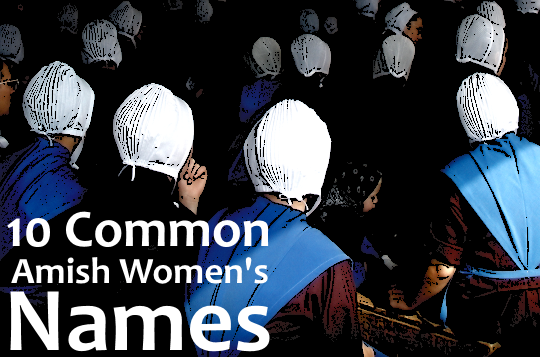 Do you know any Amish ladies with these names–or other unusual ones? Lynita – I couldn’t find anything on the background of this name. Found in a community in Kansas. Is this just a creative combination of Lynn plus the “-ita” ending? Arleta – Another one I couldn’t find much on. There is a French name Arlette. Maybe Arlene + Rita? Adel – A variant of the French-origin Adèle. I found this name in a Swiss Amish settlement. Elvesta – Not much on this one, which I found in Ohio. Female form of Elvis? I like this name. Jaala – I found one female Amish example of this name, which is actually described as a masculine name. It was borne by a servant of Solomon and means “wild goat” in Hebrew. Cevilla – Is this another spelling of Sovilla, a name you sometimes see among the Amish? I can’t find anything on the meaning of either name. According to this site there is a Spanish-origin name Sevilla. I found Cevilla in a couple of Minnesota communities. Arlowene – Perhaps, a feminized “Arlo”? Or Arlene with a bonus syllable? Rosmanda – Not much background on this one either. Sounds like a fusion of Rose and Amanda. Oneita – According to Behind the Name, the similar name Oneida comes “from the name of a Native American tribe” and might mean “standing rock.” I found this one in northern Indiana, which has a tradition of Native American place names, at least (Shipshewana, Topeka, etc). Let us know any other common or obscure Amish female names in the comments. Thanks for doing this! I’m a name nerd and love to hear the names common in other communities. Gladly, Stephani, I enjoy names too. It was hard to limit both of these lists (men’s and women’s) to just 10. Ivy, Marilyn, Frieda, Rosanna, Magdalena, Adinah. It seems my generation is coming up with names not used as much before. Keep in mind names will vary greatly from generation to generation and community to community. Strong Bible names will probably always be popular. But I’m glad more different names are being used , not as confusing. There are already way too many Johns, Josephs, Davids, Elis, etc. So bring out Boaz, Malachi, Japheth, Isaiah, Micah, Jedaiah, Hezekiah, Jeremiah, Ephraim, Tobias, Titus, Elijah, and Jonah which are also all Bible names and are being used occasionally. Someone mentioned Joely which probably means “little Joe”. In Pennsylvania Deutsch putting “ly” behind something means little. In German it would be equivalent of adding “lein” to a word to mean little. Joely probably has a father, uncle, or grandfather also named Joe. Or like in my grandmother’s family, where 3 sisters had husbands named Joe, the shortest Joe was named Joely. The most common Holmes women names in the older generation are probably Mary, Anna, Katie, Lizzie, Esther, Fannie, and Erma. Great comment Rebecca. I’ve seen a few of those men’s names here and there, and Ephraim could be considered a common name in Lancaster County. One women’s name that got my attention is Waneta. I guess it’s an alternate for Juanita. Neat name, I think I first saw it in Indiana. Where are Magdalena, Rachel, and Elizabeth? Though I’m guessing names trend and those might be a bit out of date. This is only a selection of ten of the most common names. The list could probably be 40 or 50 names long including the many others. Elizabeth is included above, at #6. Oops about Elizabeth! I was reading on my phone, and it’s too easy to scroll right past things. Thanks for posting the list! Glad “Naomi” made the list. : ) I wasn’t all that fond it as a child. No one else I knew shared my name, and I can still recall my kindergarten teacher’s scratchy voice, with a strong southern twang, saying “Nee-oh-ma,” which made me cringe. I’ve always pronounced it Nay-oh-mee, but everyone says it a little differently, and I don’t ever notice the various pronunciations anymore. I really like my name now, and I enjoy it that my husband, who is a Jon, and I have first names that blend in well in Anabaptist circles. In this part of PA (mostly with the Nebraska or white top Amish) I hear Naomi pronounced NOY-amy. Took me a while to figure out what they were saying! The other one that got my attention was “Franey” which they tell me is short for Veronica. Vernoica is SO not a name I expected to find among the Amish, but I like it. Frany might be because in German, a “v” is sounded like “f.” I have quite a few Franys in my tree! Me too, I’m thinking Frances Emma. Cevilla is a common Swartzentruber name; I’ve never encountered any of the other “rare” ones. “Fannie” is another popular Swartzentruber name, as are Katie, Barbara, Mattie, Anna, and Lizzie. In fact, every Swartzentruber family with girls probably has these name! Thanks for the extra info Karen, I wondered over that one more than any other of the “rare” ones. I believe it was in the Harmony, MN Swartzentruber settlement that I saw the name Cevilla, and there were about 5 or 6 Cevillas listed between a couple of Minnesota settlements. I imagine if the Swartzentrubers were included in the Holmes County directory I would have seen more Cevillas then. I like the name, I do wonder where it came from. The harder-to-answer but intriguing question is how some of these names entered the culture. We see Cevilla and the other spelling, Sovilla, both in family genealogy books. Both are pronounced the same way. When I saw this name, the first pronunciation I thought of was “wun-EET-a”, like Juanita. It makes me think of the girl Barney Fife was dating in the old Andy Griffith Show! Interesting thought Aimee. You see the name “Waneta” as well in that settlement (Elkhart/Lagrange in northern Indiana). What ! No Katie ! I thought that name would be first on your list. Katie was on an earlier version of the list, but I switched it out. I can’t remember why. Definitely would fit the list though. Well, as usual, I went to my son, Mark, for some of the common women’s names in the Belle Center, Ohio Amish community. I know a few of them but I don’t know nearly all of the ladies in the community. Mark does, however. Here are some of the ladies’ names that are used more than once: Ruth, Emma, Regina, Susan, Wilma, Barbara, Miriam, Emily, Mary, Leanna, Leah, Julia, Nancy, Laura, Joanne, Martha, Karen, Fern, Lydia, and Carolyn. This is fascinating, thank you so much. I love reading The Budget to get a realistic view of Amish names. Some of them are very surprising. My mother’s name was Leora–it’s not a name that one often sees. I was touched to see it on this list. If I hadn’t looked it up, I might have guessed it was someone’s variation of Laura. Glad we got it on there! I had two girls in my class at school and we’ve been friends all these fifty+ years. Esther’s mom and dad were Alvin and Esther. Esther married an Alvin and they had an Alvin, and they all lived under the same roof! Esther and Alvin had 10 kids…Alvin, Clara, Floyd, Mary Etta, Toby, Rebecca, Malinda, Arlene, Millie and Emma. My other classmate was Clara and she married Ura and they had 11 kids…Verna, Ella, Barbra, William, Melvin, Samuel, Aden, Andy, Daniel and Dena are twins, and Benjamin. Our friend Phoebe Yoder who was #9 of 16 married a Gingerich. Last fall I was sitting in their son’s kitchen and we got to talking about the Yoder family, so he got the “book” out! All 16 of the Yoder kids had kids! When I asked Jr how many first cousins he had, he laughed! We decided to NOT add the numbers up! So, in a family that is that big, names would be repeated a time or two or three and more! Ha! Well done on all these names Terry 🙂 I may have to get you to write part 2. You reminded me I wanted to write a little something on how some names are popular in certain areas. For instance, the names Lavern, Freeman, and Leroy bring to mind northern Indiana. But I am not used to seeing those in Lancaster County. Going the other direction, Ephraim, Isaac or Gideon are common Lancaster male names you wouldn’t see too often if at all in northern Indiana. Or as Karen mentioned up above, some names might be seen in certain affiliations, like Cevilla among Swartzentruber Amish. It’s another sign of how Amish circles are circles which don’t necessarily overlap. When I was meeting a lot of Amish families in the larger settlements, the rare person who had married or moved from one large settlement into another stood out–it’s pretty easy to spot the one Stoltzfus in a sea of Lehmans and Bontragers! Wie gehts Erik, The Budget came in the mail today so I was looking for some more names to add to the list. Mens: I forgot about Yost, Abe, Abbie, another new one Joely, Benuel, Matt or Matthew, Earl, Joas, Clyde, Dwaine, Nelson, Marlin, I was surprised to see an Oscar, Gareth was new, Curvin, Elias, Enos, Jesse, Javan was a new one…, Jerome, Alva, Roy. Some of these might have already been mentioned. When I read that a Jason had church I thought…hmmm…guess they’re looking for some English names to TRY and keep everyone straight! Ha! The poor mail man! Sorry, I didn’t mean to write a book again! I sure did enjoy reading Terry’s comment’s. They too made me chuckle. In April’s addition of the Connection one of the writer’s introduced a new addition to their family and it was a Javon. I had not heard that Amish name before. The comment on the Budget letters is pretty true to form. It bothers me as a teacher to read the poor Spelling and wording. One thing to keep in mind though is many of these writers are older and I’m hoping till the next generation of writers comes around it will be better. A lot of them translate what they’re writing directly word for word from how they think it in Pennsylvania Deutsch without thought to English sentence structure. I know my uncle always proofreads Grandma’s letter. Maybe a good idea for more of them. About Ruby- the name probably comes from the verses about the virtuous women in Proverbs whose worth is far above Rubies. The writing and penmanship skills that kids get today in our public schools is atrocious if you ask me! I’m the father of four who griped at parent/teacher conferences for years on their lack of cursive writing. The answer that I usually received from the teachers was, “As long as I can read it.” I have heard my old English teacher roll over so many times, she’s in a knot!lol! The world of education is so different today, but we all know that. I get the satisfaction of sitting at the kitchen table, a pot of coffee, a fire in the cook stove, teakettle singing, the wall clock ticking, and writing to our several Amish friends on paper with a pen! How’s that for a blast from the past! Letter Writing is alive and well in Amish Country. I love to read and write letters especially to good friends when you can write anything and they understand and take it as you meant it. And yes, you can’t go through a box of old e-mails and reminisce, now can you ? Where would we Christians be today if Paul and Luke and other early believers wouldn’t have written letters ? The greeting “Greetings from above” is probably a shortened version of “Greetings in the name of our Father above” or something like that. Though I agree it is not very proper. Actually the name Jason is in the Bible. Look in Acts 17 and Romans 16:21. I learned this because one of my Godsons is a Jason. 🙂 Another surprise to me was when one of the readings at church mentioned Chloe. (1Cor 1:11) I always thought Chloe was a “modern” name. I would be surprised if this name was a variant of Arlene, because of the number of Arlowenes who have German sounding surnames (which is consistent with its appearance amongst the Amish). Maybe someone who is fluent in German can help… bearing in mind the compound nature of Germanic names, so that this name could be comprised of two or three segments, each with its own meaning. In Anglo Saxon “Arl” seems to be interchangeable with Ael, Adel or Ayl, meaning noble or honourable, so this could be a variation of Adeline. Realised after writing this post that the “wene” part of Arlowene is likely to be derived from “win”, meaning friend (c.f. Winifred, Edwin, etc). There are other Anglo-Saxon/Germanic names, like Ludovin, where the first syllable is joined to the second by an “o”. This would make the meaning of Arlowene “noble/honourable friend”. I wonder a bit about Cevilla/Sovilla – allowing for the fact that the letter “v” is a relatively recent development, and would be represented by “w” in older documents, we could be looking at Ce/Sea/Si/Siegwilla – meaning “victory will”. I did at one point think of writing my own names book – maybe I still will! I didn’t mean to sound picky – it was more that I was trying to work out – “How would that name get from there to here?” – and thinking aloud. It did strike me whilst I was writing that a lot of the Germanic names are awfully warlike, and if the Amish were as interested in meanings as I am, they wouldn’t touch some of them with a barge pole. I always used to have a private smile over the fact that Baroness Thatcher’s middle name (Hilda) meant “battle maid” – very fitting. And then there’s Louis(e) meaning “loud in battle”, Edgar (rich spear)… need I go on? And yes, I plead guilty to being a name nerd. Not sure if Mum knew what she was starting in giving me a Puritan virtue name…. I’m most familiar with Lovina from researching Swedish names (which are Germanic I think). You see Lovina there as a variation of Lo, which is a Scandinavian form of Louisa. I meant Lovisa. Poor typing on my part. There’s a website that I’ve looked at which is on Norse names and includes Scandinavian ones – you can type in the start or end of a name and it will bring up all the related ones. How interesting to see that Ruby is such a common name! There is an Amish woman that writes a diary for a magazine called “our Iowa” that my wife and I are subscri to. We always enjoy her writing. Her name is Ruby Kuhns which I always thought seemed like a less common Amish name. I stand corrected. I guess a couple odd female names that I know of here in Buchanan county Iowa would be Rosie and Sophie. I’d just add that it is quite popular in northern Indiana, with dozens of adult Rubies in the directory I checked, but may be unseen in many other communities. In this list I tried to include a mix of names which were widely popular across multiple communities, and ones that were popular in specific places. Where might Eva fit in in the uncommon, common names? Hmmmm…not a scientific response, but I am pretty sure I have seen that name, but not often. So I’d slot it towards the uncommon names. I think “Iva” is more common. Eva and Iva are about in the middle between common and rare. I am very surprised that Rachael and Leah didn’t make the list because they were both very common Amish women’s names in Michigan and Ohio when I was a kid. Both of those are very common here in Holmes Co. I’m guessing it just depends on where you’re from.Bible names seem to always be popular and others come and go. In the Church and Family Directory of the Upper Valleys of Pennsylvania, 2013 for our area of South White Deer the common female names are: Rachel, Sarah, Katie, Barbara (Barbie), Emma, Ruth, Ann (Annie), and Fannie. Didn’t find too many unusual ones but a few less common names were Sylvia, Gertrude, Edna, Eva, Lena, Priscilla, Salome, Nancy and Kathryn. I enjoy seeing when a family will use the same “name” for mother and daughter. Example…Dorcas/Tabitha or Esther/Hadassah. And yes, I know a Ruby where I visit and attend an Old Order Amish Church. Thank you Erik, for the post. It’s always interesting to see which regions feature certain names, male or female. Beverly, for whatever reason, we hear “Bevly” or “Babbie” often used as a nickname for Barbara, so there is a variation of your name being used. 🙂 It’s heard more in PA than in Ohio, though. Bevley would be the closest! “Babbie” is connected to Barbara..so at least I have one simular to mine! In any case, that is interesting! Thank you for posting!! I was just doing a FB search and came upon this old post! Yes, there is my name with the unusual ones! It’s unusual enough you seldom find it in print. Would love to know its origins. The other options would be (a) a version of Elisaveta, the Eastern European take on Elisabeth; (b) a version of Alva, which is derived from Alfred. Various dictionaries suggest that Alfred = elf counsel (ALF + RED), but it is equally possible that it could be noble peace (AEL + FRED). Vesta itself is the name of the Roman goddess of the hearth – which I’d discounted as an origin for Elvesta’s name because the Germanic names were pretty much in place before the Romans invaded Germany. There’s also Sylvesta on the Norse names Wiki – pretty obviously a feminisation of the male name. I recently found a website on Biblical names, www.abarim-publications.com, which views Mary and Miriam as derived from “myrrh” ratgher than their usual meaning of “bitter”. I had wondered why God didn’t change Mary’s name, which He seems to have made a bit of a habit of doing with key figures whose original name was inappropriate. German name Adelgunde. That is my aunt’s name. She was called Gundel or Adel. The name Wilma is my mother’ name, also German. The name Rosamande could be Rosamunde also German. Also the name Elisabeth and my German name Susanne are typical, s instead of z.